Sound Transit Proposition 1 was leading with 55 percent overall approval following Tuesday-night counts in urban King, Snohomish and Pierce counties. Although the measure was trailing in Pierce County, it required only a simple majority of the combined votes to pass. Voters appear ready to open their wallets Jan. 1 for a bigger transit future, by favoring a record tax increase to finance light-rail, commuter-train and bus-line extensions to rival some of the nation’s longest transit networks. 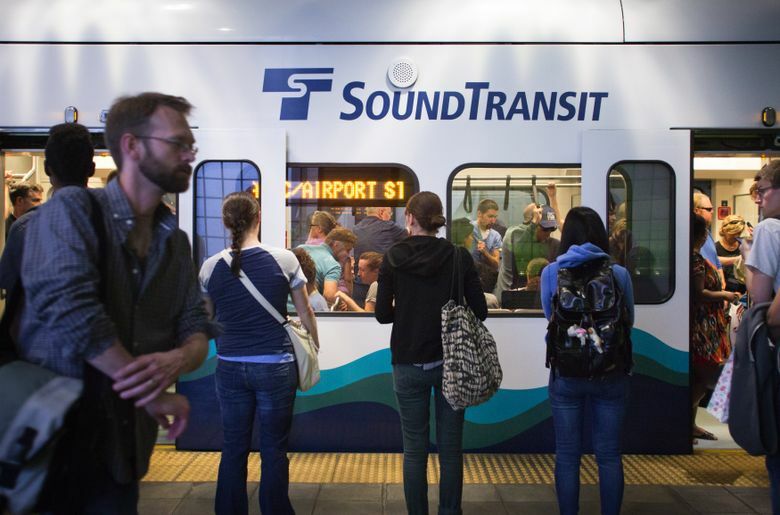 The $54 billion, 25-year Sound Transit Proposition 1 was leading with 55 percent overall approval, following Tuesday night counts in urban King, Snohomish and Pierce counties. 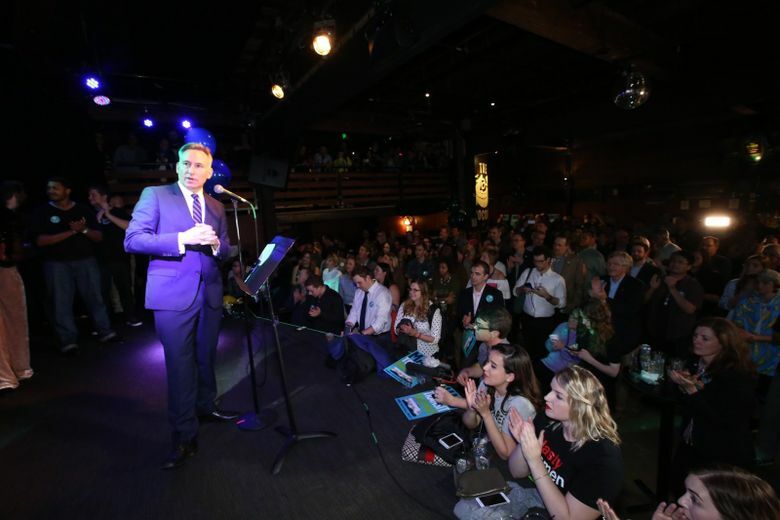 “By embracing mass transit now, we are saying yes to a better quality of life for us, our children and our grandchildren,” said transit-board Chairman Dow Constantine, the King County executive, at the supporters’ party in Seattle’s Belltown neighborhood. “People have just plain had it with the traffic. There are too many cars for the area. People understand this,” he said later. The tally reflects frustration with bus or car commutes that routinely take an hour from Federal Way to Seattle, or 80 minutes from Everett to either Seattle or Bellevue. It also shows a willingness to pay more in property, sales and car-tab taxes even for transit far in the future. While King and Snohomish counties favored Sound Transit 3, fewer than half of Pierce County voters were supporting it, just as in a 2008 Sound Transit 2 vote. Proposition 1 needs to win the combined count — not all three counties. At this point, remaining ballots would have to do a complete reversal for the measure to lose. Full buildout would give the region a light-rail system of 116 miles, which Sound Transit CEO Peter Rogoff extols as similar in reach to Washington, D.C., and Bay Area Rapid Transit (BART). 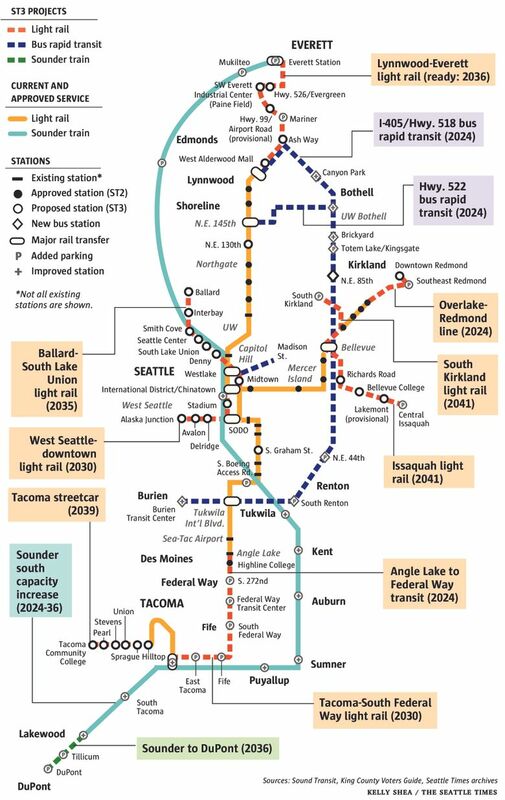 Someday, a train ride from Mariner/128th Street Station, just south of Everett, to the University of Washington could take 35 minutes, and a trip from Tacoma to the airport 33 minutes. But despite a campaign named Mass Transit Now, two decades are required for the Ballard and Lynnwood-Everett lines. Constantine called the plan’s 2035 Ballard grand opening “conservative” and said the agency hopes to launch service faster. The earliest major projects are Federal Way and Redmond rail, aimed at 2024. Bus-rapid transit lines with added park-and-ride spaces, are scheduled that year as well, along Highway 522 and Interstate 405. Seattle Mayor Ed Murray said Tuesday night “it was a big ask,” but pointed out Seattle passed five big tax propositions in the last three years. One of those was a $60 car-tab fee to add city bus service, another a $930 million, nine-year levy for streets, maintenance, sidewalks, bus lanes and bikeways. In a historic night for transit, Los Angeles Measure M, a $121 billion plan with at least $80 billion for transit, was close to meeting its two-thirds requirement in partial counts Tuesday. A Spokane Transit measure for increased service was ahead, according to tracking by The Transport Politic. “The issue hasn’t really been whether to move forward with this service, but how quickly they [Sound Transit] can extend service to communities that are demanding it,” said Jason Jordan, executive director of the Center for Transportation Excellence, which tracked 47 transit measures across the U.S. Component post 10200666 could not be found. Pierce County Assessor-Treasurer Mike Lonergan, an opponent, said voters there got the message it “was about a tax,” and the lion’s share would go to light rail from Tacoma to the airport. “That’s of limited value to the majority of Pierce County residents,” he said. Preparations would begin almost immediately, spokesman Geoff Patrick said. The environmental-impact statement is done for Angle Lake to Federal Way. The Overlake-Redmond line is ready to begin engineering and final design. “We have a strong running start,” he said. Negotiations would begin with BNSF Railway to add capacity and frequency along the south Sounder commuter-train line. The agency promises near-term bus improvements, such as retrofitting freeway shoulders for express buses; launching Madison Street bus-rapid transit by 2019; and unspecified work for the Ballard D Line and West Seattle C Line. After all, congestion won’t magically clear up during the 14 years that West Seattle waits for rail, or up to 19 years for Ballard and South Lake Union.